A steel building garage kit is the perfect solution to your backyard storage needs. Garage kits include easy to read erection manuals that enable you to put up your building with as few a three people in only a few days. The steel in American Steel Span's steel building garage kits is of the highest quality, heaviest gauge in the industry and all components in these garage kits are 100% made in the USA. 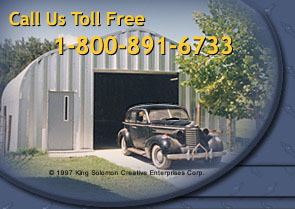 All American Steel Span garage building kits are designed to your specifications. Precision manufacturing enables these garage kits to meet or exceed industry standards including Florida approval codes. American Steel Span ships their garage kits nation-wide. Your garage kit will ship factory-direct. Efficient scheduling, delivery and share-loading reduce costs and the savings are passed on to you, the customer.